You'll celebrate Christmas? That's right, Christmas is coming soon. For that you definitely need the images associated with Christmas. Maybe you'll need a Christmas picture for your Christmas greeting card. 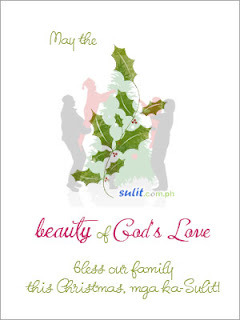 The following figure is an image provided by Sulit.com.ph and you can use it to make your Christmas cards to people you love.